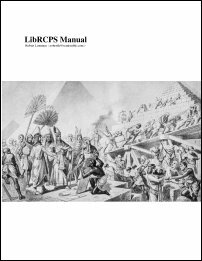 LibRCPS comes with a manual in PDF format, that is also included in the source distribution. Of course you can also browse the manual for the latest version online. Additionally, the LibRCPS source distribution contains a simple example: a program that reads a project description from an XML file, schedules it and returns an annotated XML file. Looking at this example might explain a few things in a different way than the manual does. You might also be interested in my thesis which explains the resource alternatives extension in detail. If you are looking for an exhaustive introduction to the whole thematic, I would recommend "Project Scheduling under Limited Resources" by Sönke Hartmann. This one will also refer to many other papers and books that are interesting.